'Dead thing can sound alive when they choose. Dead things can move around. When Elliott and his brother move into the old and crumbling Glebe House they don't expect to find themselves sharing it with ghosts. But soon sinister events are unfolding. An old diary reveals glimpses of the mansion's past - and of a terrible tragedy. An old woman talks to ghosts - but is she in fact being controlled by them? And what of the sinister East Wing - a hideous labyrinth devised by a truly twisted mind? Can Elliott and his family escape the clutches of Glebe House? Or will they end up trapped in the endless maze of corridors, forever hunted by the dead? Cliff McNIsh knows how to scare the pants off you! This book is full to the brim of hair raising, spine tingling, ghostly moments that will leave you constantly looking over your shoulder. You won't be able to sleep at night, as you analyse each and every sound to convince yourself there is no such thing as ghosts! 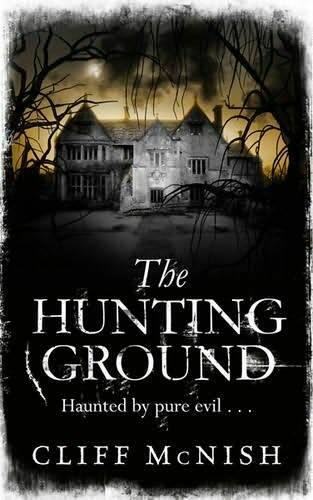 This book is told from the point of view of Elliott, a sixteen year old boy who has moved into a rather sinister house with his father and younger brother, whilst his dad repairs the house to sell. The house alone, is a huge character in this book. Glebe House is just full of evil and it seeps out of the page, playing tricks with your mind. If this house was real, I wouldn't even step in it's driveway, let alone stay the night. The paintings! Oh my - how I didn't walk round my house and turn every picture I have to the wall, I really don't know. Cullayn is a really evil character in this book. I haven't come across such a sinister character in some time. Yet Eve, the little ghost girl is quite a match in evilness. Every time she came into the story, all I could think of was the film The Ring, and the girl coming out of the television! Janey was an excellent character - I really loved her flower dress, covered in real flowers. She really had me fooled and confused as to her real intentions. I loved the use of the diary. At one point, I wasn't sure who Elliot should trust, as the author had created so much doubt in my mind. I also loved the ending of the book. I was pleased the way things turned out for all the characters. The plot was excellent and fast paced. The events of the book all occur in a matter of days. Once Eve had revealed herself, I thought they would have made a quick exit from the house, but no, they decide to stay another night. Madness! I would have been out of there quicker than it would take me to blink. This book is dark and atmospheric and will keep you up all night. It is definitely not suitable for younger readers who might scare easily. Cliff McNish is an excellent storyteller. He knows how to achieve the highest creep factor in a book. I am adamant that I wouldn't want to sit around a camp fire with him, listening to his ghost stories as I would spend the whole night awake. I still find it amazing that someone so funny and charming, could write such a scary book. Oooooooh, I really want to read this one. I love ghosties and creepies! What a fab cover too - it's creepy enough in it's own. A spooky enough cover, I think the story would be too scary for me. Oooh I love a good ghost story! Definitely loving the sound of this one - especially because of the high creep-factor. Glad you enjoyed it, and great review! I'll keep an eye out for this one. It is so long since I've been properly scared by a book, think this one might do the job. This sounds right up my street. I love spooky old houses! I love that cover! I haven't heard of this before but I will have to check it out. Great review! sounds fantastic, this is right up my alley. cool cover too. I loved this one - so scary and creepy, would completely agree that 'Cliff McNash is an excellent storyteller'! I love horror books but I'm just not sure on this one, it is a good review. Darlene - the cover is definitely freaky on its own. Petty - go on! Give it a go! You might like it. Liz. R. just don't read it late at night. Jenni - Cliff is very good at scaring the pants off you. Vicki - I think that is my favourite aspect of ghost stories too. ooo I love the sound of this one! !